Putting a systematic network level safety assessment tool into designers’ hands, to help build roads safely the first time. Thursday 29 November: With support from the World Bank’s Global Road Safety Facility, iRAP has launched the new Star Rating for Design (SR4D) tool at the Vision Zero and Innovation Workshop in Washington, DC (29 November 2018). The SR4D tool will empower designers and road engineers to assess the road safety of a design and improve its safety star rating before the implementation of civil works. It will enable the Star Rating Methodology to be streamlined into the road design process. Dr Soames Job, Lead Road Safety Specialist at the World Bank and head of the Global Road Safety Facility said this tool comes at the right time to empower designers to work towards the UN targets to ultimately save lives and prevent serious injuries from the very first stage of the design process. ‘We are proud to financially support the development of this tool, which will prove to be an efficient application for getting safety right the first time, thereby saving lives and resulting in significant financial savings compared with road upgrades post-construction. The SR4D tool will also assist in delivery of the World Bank’s Road Safety Safeguard, a strong commitment to road safety that went live in October 2018,” Dr Job said. SR4D can also strengthen the road safety audit process, complementing it with an objective and repeatable qualification of road user risk and support the wider and more immediate application of Star Ratings as a safety performance metric. James Bradford, the iRAP Global Product Director said, “We are excited to launch the SR4D tool today and for the opportunity it presents to revolutionise road design safety globally. “The tool will be available as part of iRAP’s free-to-use toolkit making safer road design accessible for all, including low- and middle-income countries. 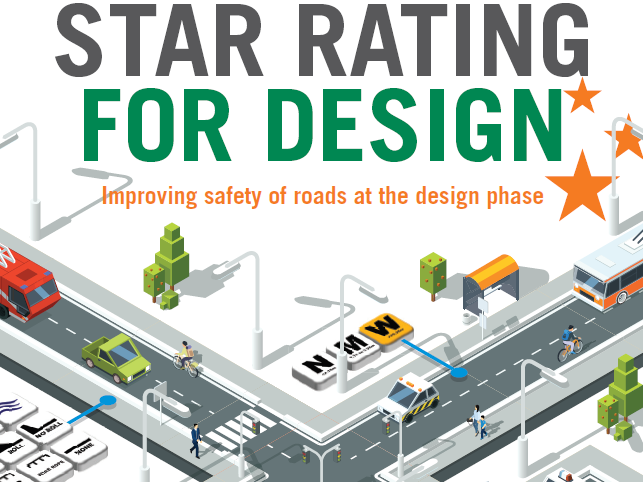 “Any suitably trained engineer or road safety practitioner will now be able to more easily carry out a design Star Rating, ensuring improved safety at the early phase of road projects and maximised safety of road infrastructure investments. “The tool also facilitates the setting of Star Rating targets in a road design tender process. This will raise the competitive bar among design teams and add safety performance to the more traditional project evaluation criteria like cost, time, and quality,” Mr Bradford said. The SR4D tool is one of the Innovation Partnerships within iRAP’s Innovation Framework online hub, which demonstrates how leading innovations have evolved and are being continuously improved through the application of local expertise, philanthropic support, and the peer review of global experts. SR4D was launched at the Vision Zero and Innovation Workshop, hosted by iRAP, the Inter-American Development Bank (IDB) and the World Resources Institute Ross Center for Sustainable Cities (WRI). The event is bringing together 200 global partners with a key role in shaping world-wide action to achieve Vision Zero and the UN Global Road Safety Targets. Held annually, the iRAP Innovation Workshop draws together global policy and technical leaders along with investment experts and those with the capacity to implement change and ensure that safer infrastructure and vehicles deliver their potential in creating a safe transport system. For more information on SR4D and the partnerships that have brought it to fruition, click here.